To many, souvenirs are a form of saying “I’ve been there!” when they travel to another country. As for myself, I’m not a big fan of buying souvenirs. However, due to demand for souvenirs from people back at home – it has to be done, right? So when I traveled to Seoul, I had to do did some souvenir shopping. 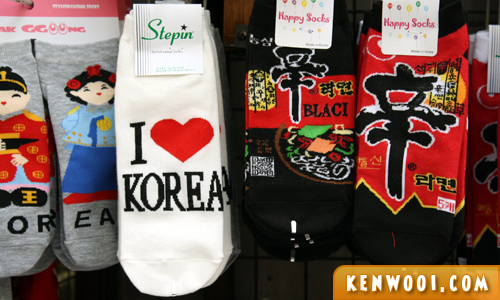 Well, there are quite a variety of souvenirs to choose from here in Korea. 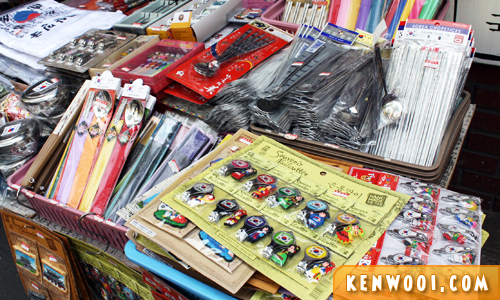 To look for souvenirs, the most convenient spots are at the street markets, such as Myeong-dong Market and Insa-dong Market. From kitchen utensils to handbags, apparels to beauty products – there are so many to choose from. Street markets are definitely great places for tourists to purchase some souvenirs. Most of the souvenirs have a touch of the local culture. 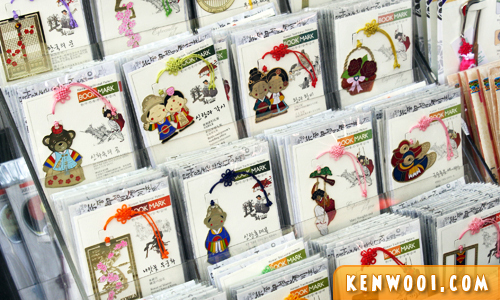 They symbolize the strong Korean tradition that has been preserved for generations. 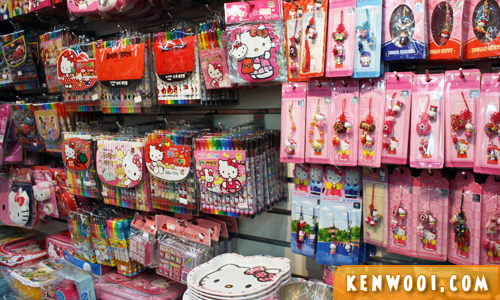 On the other hand, there are also modern souvenirs – such as Hello Kitty. Know what, you can practically see Hello Kitty stuff at every corner of the city. It’s even available at the Hello Kitty Cafes. I don’t know what’s the fuss about Hello Kitty. Cute? Perhaps. By the way, you may think that there would be loads of Psy or Gangnam Style souvenirs in Korea since it’s a worldwide hit – but I somehow didn’t notice much of them. Hello Kitty still rulez in Korea. Besides that, facial masks are quite popular as well. Apparently they’re very cheap in Korea, and yes indeed – they’re so much cheaper than the ones sold in Malaysia. 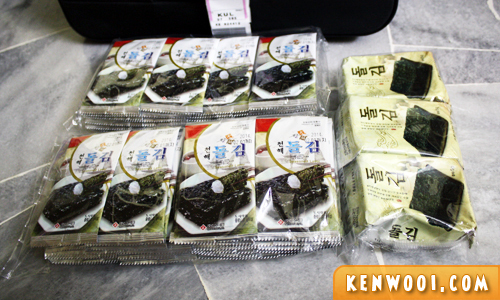 A pack in Korea costs KRW1,000 (RM2.85), while the same exact pack in Malaysia costs RM6.00. 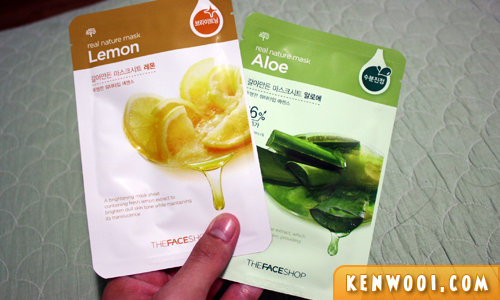 No wonder facial masks are selling like hot cakes in Korea. Anyway, souvenirs in Korea, or Seoul in particular, is quite affordable if you allocate the budget for it. 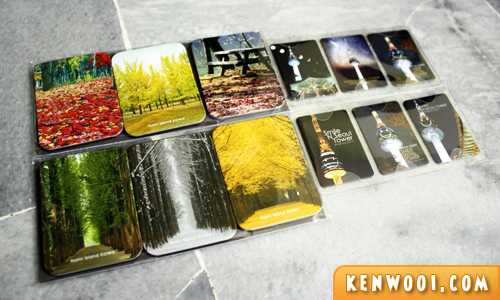 The souvenirs may cost as low as KRW1,000 (RM2.85) and up to KRW20,000 (RM57.00). Well, there are certainly souvenirs that cost higher for the wealthy travelers. But if you’re a budget traveler, better stay cheap. At the end of the day, shopping for souvenirs seem quite fun after all – especially when we went from store to store to search for gifts, and bargaining for a better price. Oh no, ‘bargaining’ doesn’t work most of the time because the most common reply we receive is “Very cheap!”. So, what souvenirs did we get from the trip to Seoul? 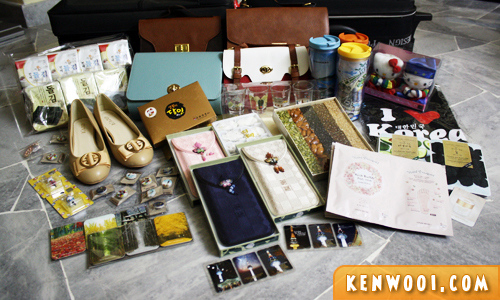 TOTAL DAMAGE: KRW373,900 (RM1,065.62) for all these souvenirs from Seoul, Korea. If you’re wondering – yes, I keep track of our traveling expenses at Seoul. It’s a habit. Packets of seaweeds. They’re quite delicious and I finished 1 whole pack (28 sachets) within a week. Sure wish I had bought more seaweeds. 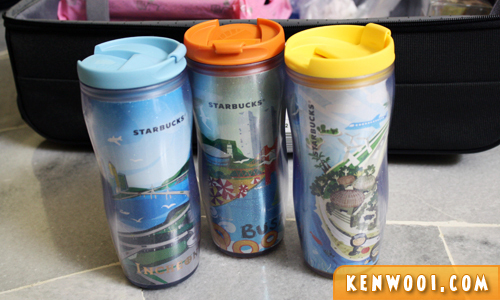 Starbucks tumblers from Korea. One costs about KRW15,000 (RM42.75) and they come with a complimentary beverage each. 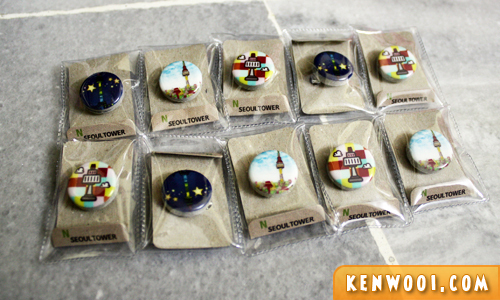 Mini pin badges bought from N Seoul Tower. Simple and suitable to be given to kids – they can pin it onto their bags or wherever they like. Fridge magnets. It’s the most common souvenir to buy from any country. These magnets make fridges look like they traveled the world more than anyone else. 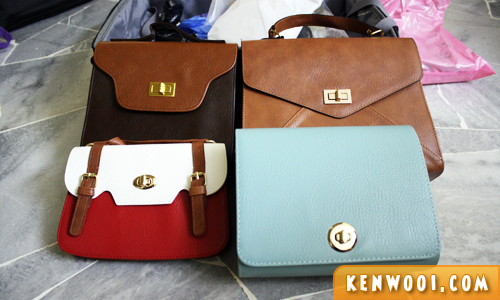 Handbags for the ladies. Definitely not branded ones as they cost at most KRW20,000 (RM57.00). Quite stylish, I must say. 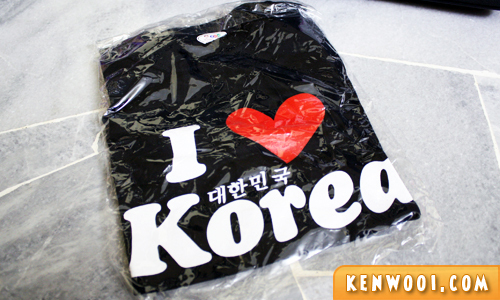 “I Love Korea” shirt. This is another common souvenir – every part of the world definitely has its own “I Love The City” version. 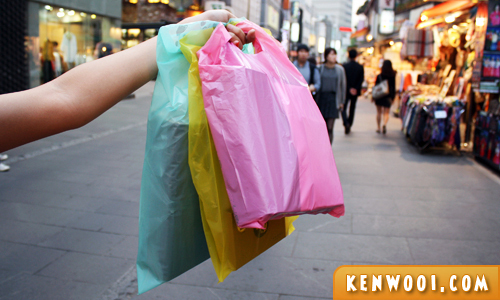 In fact, the clothes here in Korea are pretty cheap and affordable. Since I’m also not a fan of buying clothes… I didn’t buy any fancy clothes. Yeah, so obvious. But hey, if I like buying clothes, I’d SO walk into this store and purchase some interesting clothes! Oh wait a minute, I don’t think I can. Crap! Salute you guys for able to stuff everything so neatly in the luggage. Hey the 3rd pic…friend bought one of those bookmark for me from korea. The second from the left…blue n red figures. Hi Ken. How much is the approximate expenses needed if I would like to visit Korea for a week or two? Cuz i heard that going to Korea is quite pricey, which is around about RM4000-5000 right? Thanks! (cuz I’m doing my research for a trip I am planning to have in 2 years time. :) )Thanks! Will blog about my expenses in Seoul soon. Stay tuned! I bought so many socks ahahaha. how much does it cost for a pair of sock and a keychain? I also always keep track of my travel expenses and always shared with my readers in my blog. I even went Jeju Island as well and only spend roughly RM3.5K throughout my trip. wow.. u bought more than me! i mainly purchase food souvenir.. did u try market-o chocolate brownie? i bought those for friends. seldom buy souvenir.. I always buy practical souvenir for my friends and relatives. No key chain and fridge magnet. I have thrown the keychains countless time from my drawer. Keys is already heavy. It is really not serving the purpose to add weight on your pocket by adding the key chain. can i know, what it call for the item in box with black color that u bought? phone casing? Chance upon your blog when I was researching on what souvenirs to get in Seoul. Can I asked where did you buy those fridge magnets? They looked so nice for gifts.